All posts tagged with "opt-in suffering"
As we build up to release, we must consider and balance gameplay difficulty as a whole given the set of game mechanics features we are working with. There are not only multiple axes upon which difficulty might be defined – and upon which gameplay mechanics operate – but also a diverse spectrum of expectations and player-types to consider. 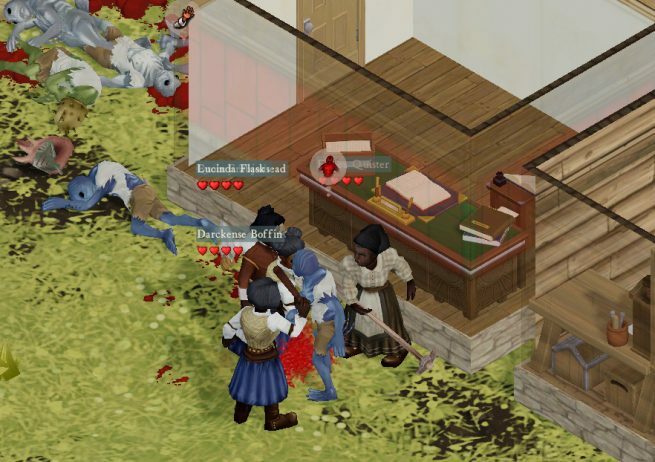 On the one hand we have combat-hardened veterans of the Frontier who have sunk hundreds of hours into Clockwork Empires. These players derive grim pleasure from deconstructing our systems then optimizing them for maximum in-game effect while rampaging cannibalistic cultists tear each other apart amidst volleys of gunfire. On the other hand, we have players who just bought the game (or will soon buy the game) who are mostly fascinated by watching their colonists live little lives and decorating houses. Both players have legitimate needs! If a swarm of fishpeople busts into this latter fantasy and eats everyone, that player gets really upset. If a swarm of fishpeople doesn’t bust into the fantasy of the previous player type, they get really upset. And everyone is upset with us if we do any of this without giving proper warning.